A moped is a great investment if you live more than a ten-minute walk away from your local beach. It’s so easy to jump on a scooter and do a surf check, without worrying about parking hassles and getting stuck in traffic. Loading up a car, driving, then possibly not even going surfing is wasteful. If you do go surfing you need to hide your car key somewhere awkward (yep, we all know about the secret spot on top of your rear tyre). 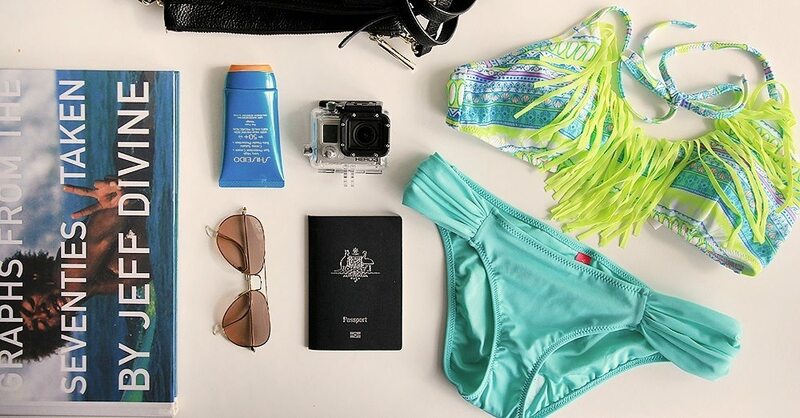 A scooter means freedom, agility and bringing a slice of Bali into your everyday life. You’ll save a heap of cash on fuel too. To transform a scooter into a surf vehicle is easy. Just screw on a set of surfboard racks and you’re ready to go. 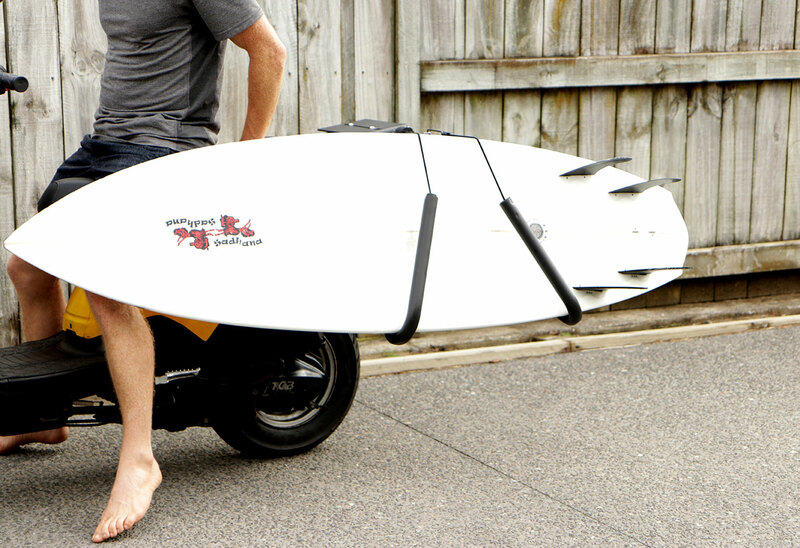 Problem is, we’re not in Bali, so where does one pick up a set of surfboard racks designed specifically for mopeds? I searched around and found the perfect solution, made by an Australian brand called Far King Surf. No other surf brands (that I could find) manufacture surfboard racks, so it was a relatively easy decision to invest in Far King’s product. I ordered the product on SurfStitch.com (link at the top of the page) for the handsome price of $200 AUD. At this price point I definitely had high expectations. Note: Far King offer a range of other interesting gear and accessories – we’ll review their surf hats and wax soon. Installation wasn’t as easy I hoped. The instructions on the box say: Step 1 – Attach to packrack / under seat using allen key enclosed. Tighten to secure rack for appropriate weight. If you watched the video review you’ll see this was not quite so simple. Perhaps my assistant and I have bad technique but we found connecting the rack arms to each other really difficult. Paint was coming off the tubes and they require significant twisting and wiggling to click into place. We got there in the end and the fit is, at least, snug and the arms feel robust. They have built-in retractable tie-down straps to hold the board in place. This genius innovation makes the racks super simple to use, with no additional straps or cables required to hold your board in place. The actual rack arms swivel, meaning you can adjust them to suit the board you’re transporting. The rack arms have great quality padding. The racks are made of aluminium, so won’t rust. In my testing I found the racks to be stable and secure. Depending on your moped’s rear luggage rack your surfboard racks may end up positioned quite far back. You need to choose an appropriate location for your surf racks and if your scooter doesn’t have a rear luggage rack you’ll need to get one. Make sure your luggage rack is fixed tightly to your bike as it will bear a heavy load when you’ve got your surf racks installed and a board strapped on. I found pointing the surfboard nose inwards provides a better driving experience but you’ll need to figure out what works best for you. I find there is less drag with the nose pointed in, but if you have a longer board or the nose of the board is touching the bike you should point the nose out and position the board further back on the rack. Never obstruct your moped’s driving functionality. The surfboard racks do extend quite far out from the side of your bike so please get used to judging your dimensions in a safe place before you hit the road. It is also a good idea to mount the racks on the opposite side of the bike to your exhaust so you don’t inadvertently melt your wax, or set fire to your board. Unlikely to happen with newer bikes or Vespa-style mopeds, but if you have an older scooter with an exposed exhaust then take care. After some initial installation issues I am very happy with the racks. They are sturdy and robust. I like how easy it is to remove the rack arms if you don’t need them and I love the innovative design features like swivelling arms and retractable tie downs. If you’re considering adding racks to your moped and don’t want to build a homemade contraption or just want something that is purpose designed for surfers then Far king has come to the table with a really attractive product.